Today is National Doughnut Day, which is pretty awesome. Every year I find out about more semi-obscure holidays extolling the virtues of all kinds of foods. Examples: National Popcorn Day, National Pie Day, National Candied Orange Peel Day, and National Cherries Jubilee Day. You should go look around on that website. There is a celebration nearly everyday. 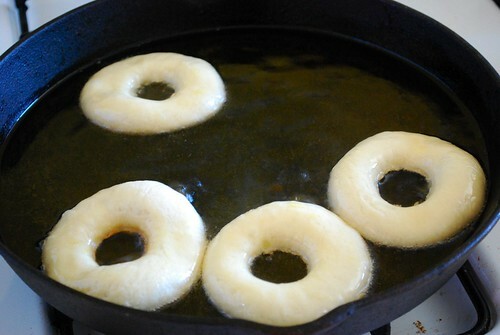 So in honor of today’s holiday, I decided to make some donuts. Makes sense, yes? Though I do wonder, how does one officially spell “donut”, anyway? I see it spelled “donut” and also “doughnut” and am very confused. Which is correct? Does it matter? Is one more popular than the other? It seems to simply vary from one shop to the next, without rhyme or reason. I’ve elected to use “donut” because there are fewer letters. Also, the Donut Wheel, the best donut shop ever, utilizes that spelling. I bow to them as the donut gurus. Donut recipe from Secret Donut Recipe; glaze modified from their vanilla glaze recipe. Yes, this recipe uses potato. 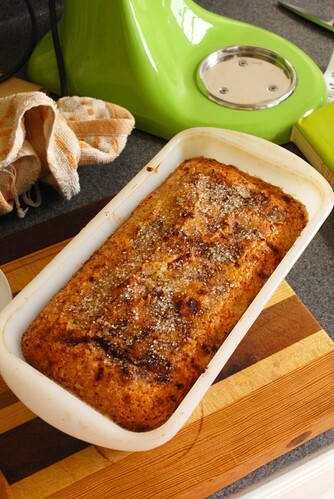 At first I thought that potato was a very strange ingredient, but I decided to give it a chance because I love potato bread so much. It was not a mistake. These donuts are amazing! 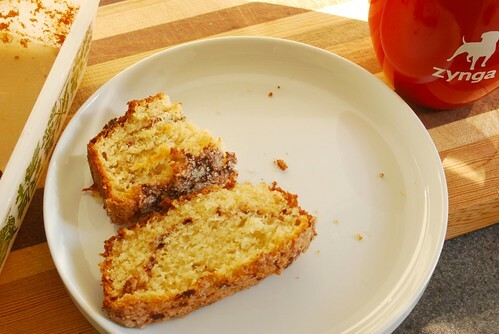 Very easy to handle and results in a fluffy and moist donut. Give the potato a chance! So first, what you will want to do is prepare the potato. Prick it all over with a fork, and put it in the microwave to cook. If your microwave has a baked potato setting, use that. Otherwise, microwave for a minute or two at a time and check it . 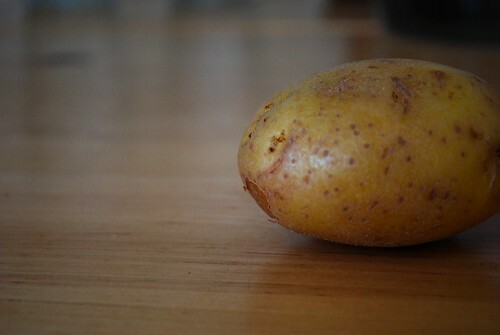 The potato should be soft to the touch. Let the potato cool and warm the cup of milk. Add the yeast to the milk along with a pinch of sugar and allow to sit for 5 minutes. Cut the potato in half and scoop out the insides. 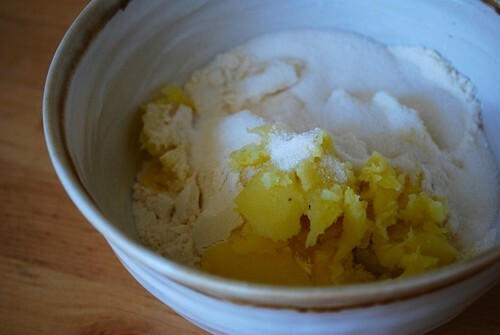 Add the flour, sugar, and salt. 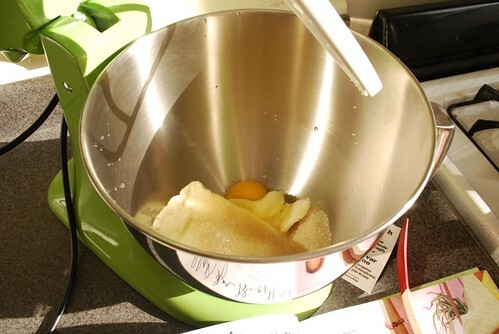 Mix together and add the milk and yeast, and 2 TB of oil. 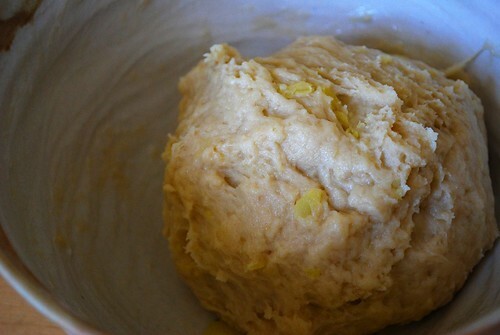 Mix with your hands (or using a stand mixer, but I don’t have one of those) until the dough forms a cohesive ball. 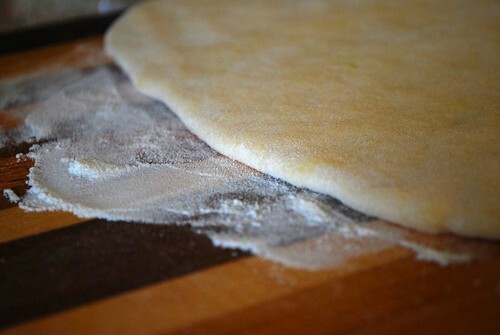 The dough will be a little sticky. 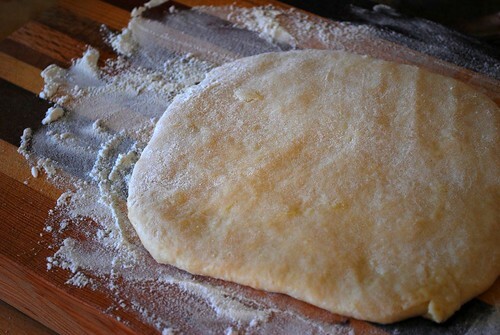 Spread a surface with flour, turn the dough onto the surface and knead a few times. Spread to 1/4 – 1/2″ thick. I did mine about 1/4″ using just my hands and a cylindrical rum bottle. 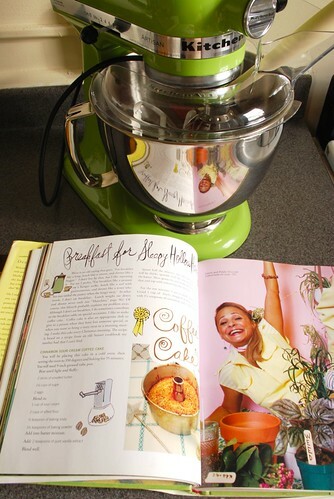 I don’t have a rolling pin, either! 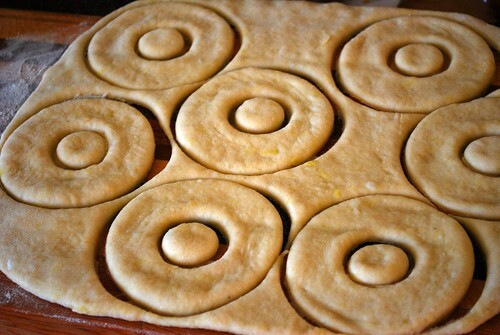 Cut donut shapes using either a donut cutter (which I also do not have) or circular household objects. I used a drinking glass for the large circle and a bud vase for the small circle. I’m resourceful! Let the donuts rise for 10 minutes. 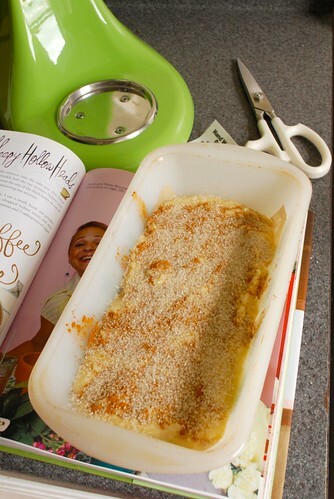 While you wait, fill a cast iron pan 1/2″ with oil and heat. I heated mine at about medium heat for 10 minutes and the oil temperature was perfect. 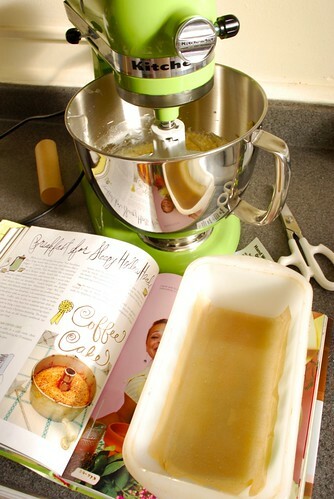 During this time, you should also make the glaze. Warm the milk and the butter. Add to the powdered sugar and mix. 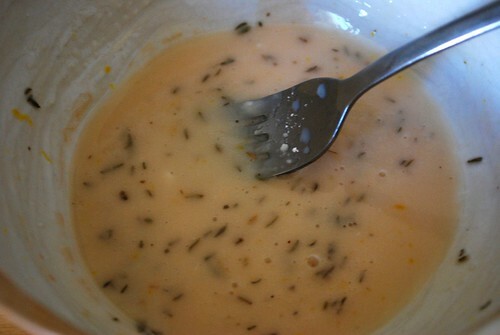 Add the lemon zest, vanilla, and thyme. Mix together. 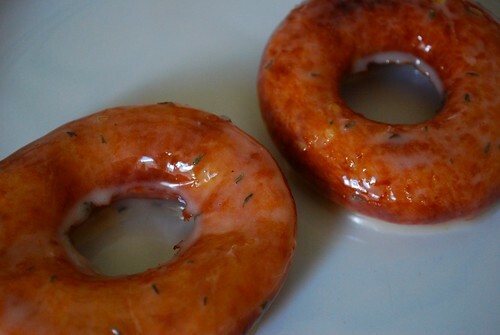 Feel fee to leave out the lemon and thyme if you would prefer a simple vanilla glaze. 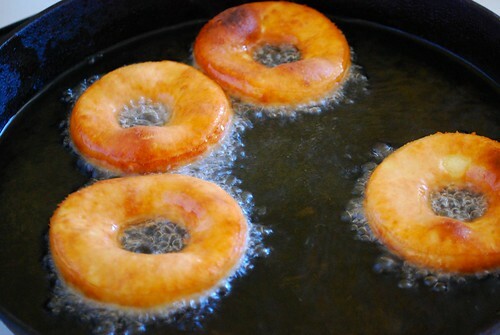 Cook the donuts until golden brown on each side. This only takes a few minutes, so be sure to watch carefully. Let cool on a plate lined with paper towels. 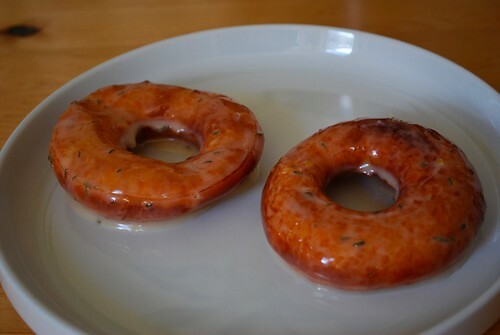 When the donuts have cooled, dip them into the glaze to cover and put them on a plate to allow the glaze to set. Look at that deep fried glaze-y shine. Perfection! And yes, they absolutely do taste as delicious as they look! Now excuse me, I have a half dozen donuts to eat.